Instructions on how to Remove/install a rear shock. Before you do this take a good look at your shock and swingarm and try to get a good understanding of how everything is connected and how the parts support eachother. Wrenches to unbolt the shock. Size depends on bike. Allen set if you need to lift the tank. If you can remove your rearwheel do so, it makes the job a lot easier, the wheel can get in the way. 1. Put the bike on your rear stand. (Remove your rear wheel if you can) You could use another set of jacks for the rear if you dont have a rearstand but I do not recommend it. A rear stand is very useful and you can get one for around $100. 2. 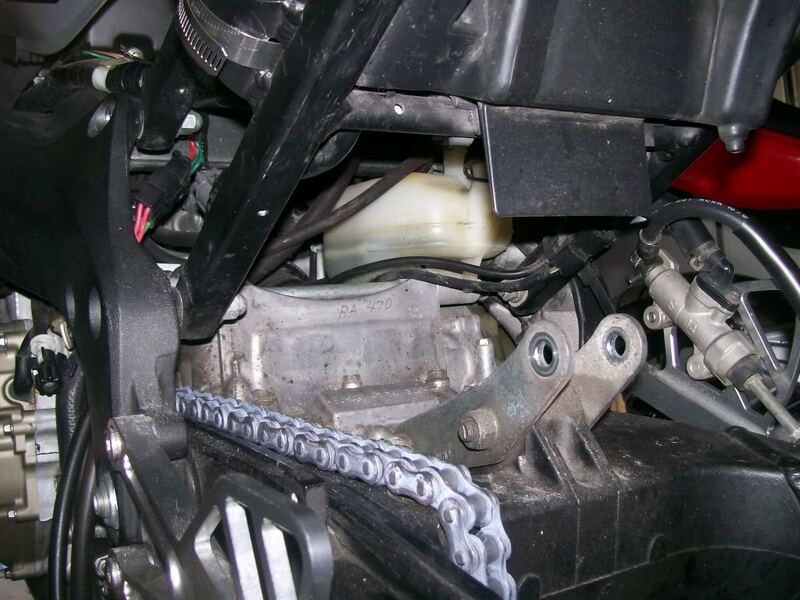 Place jacks underneath the rearset pegs. The jacks will support the entire rear end weight once you remove the rearstand so make sure they are on a flat surface and stable. I used 25lb weights to add some height to the jacks and provide a solid base. 3. Loosen the mounting nuts/bolts on the shock. IMPORTANT: Do not pull the bolts out, only loosen the nut. The shock is not compressed at this point so dont worry about it springing loose or doing anything weird. I found this step to be the hardest, I had to unbolt my gas tank and lift it several inches to reach the upper mounting bolts on the shock. You may be able to reach them easily but on my 01 f4i they were kind of hidden. If you have to lift the tank a little there is a drain hose that easily gets pulled off. Note the pics below. 4. After you loosen the upper and lower mounting bolts it is time to remove the rear stand. You can drop your bike if you are not carefull here, Do this slowly. 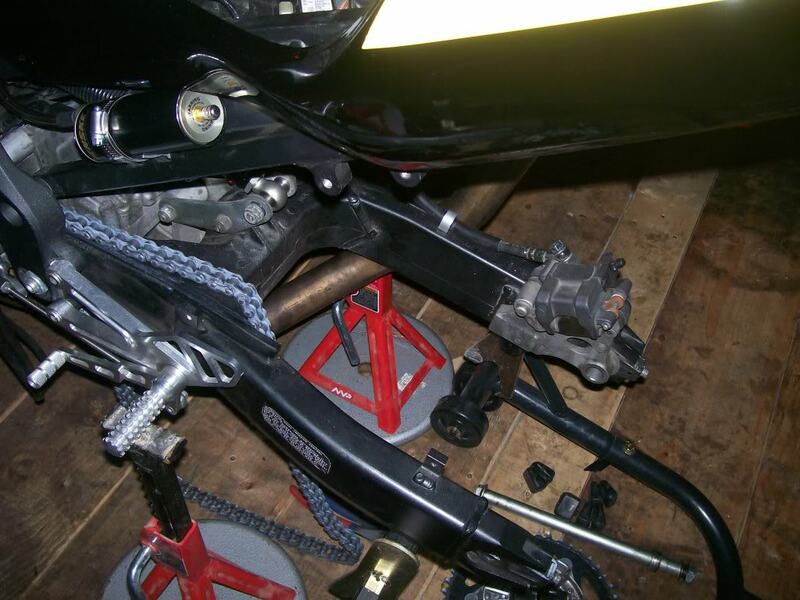 When pulling the stand away make sure the rearset pegs sit evenly on the jack stands. The swingarm will drop down slightly but not the whole way since the shock is still attatched. 5. Now it is pretty easy. Completely remove the bolts holding the shock on and the resivour. 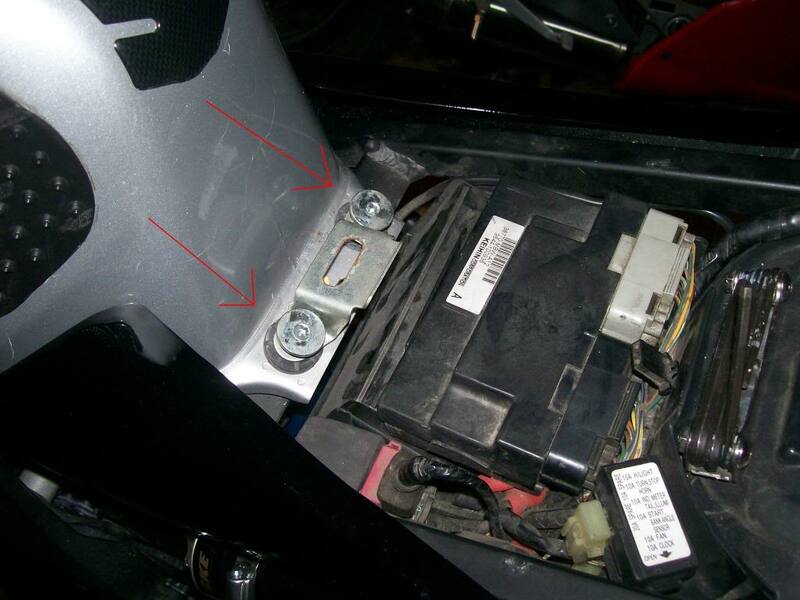 When you remove the lower mounting bolts the swingarm may drop even more since there is nothing supporting it anymore, use a piece of wood or something to support underneath so it doesnt smack the ground. Pull the shock and resivour out. If you were able to take the shock off succesfully it is very simple to put back on and Im sure you can figure out the process. Just reverse the steps. 1. The bike should still be sitting on the pegs using the jack stands. 2. Mount up the new shock and tighten the bolts. 3. 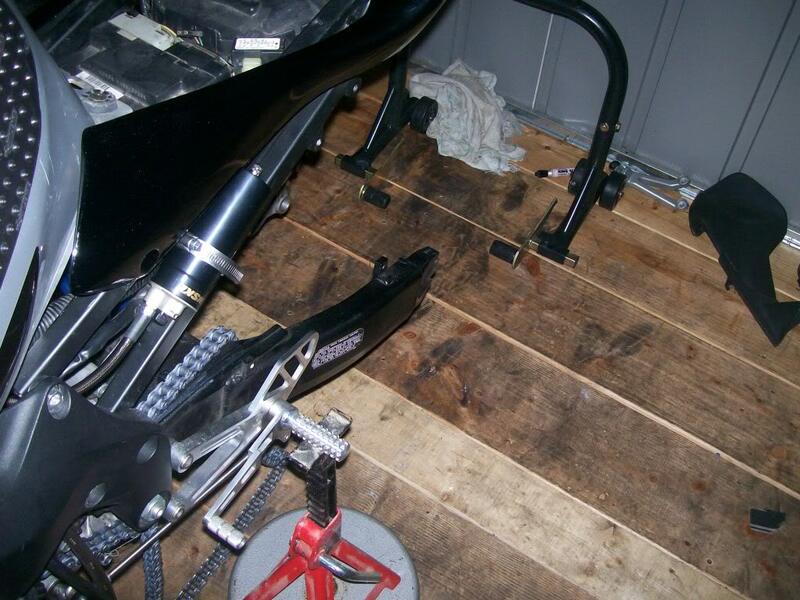 Once the new shock is on and bolted in place use the rearstand to lift the bike up and off of the jack stands. You are done. Check everything!! and double check it. Here are some pics of the process Ill try to explain what is going on in the pictures. I have removed the rear wheel and have the bike sitting on the rear stand at this point. Putting Jacks under the foot pegs while the bike is sitting on the rear stand. Loosen the mounting bolts. Here is a pic of the upper bolt, I already have my tank lifted so I can get at it. 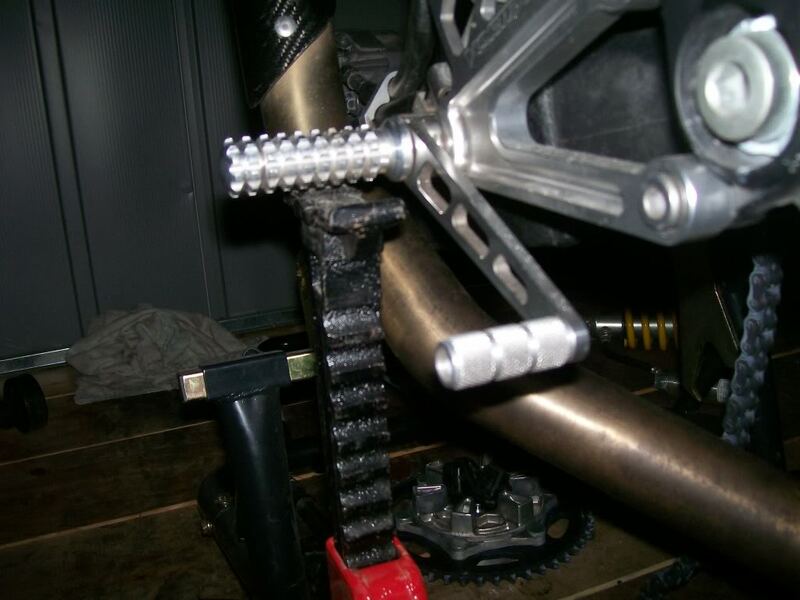 Once the bolts are loose slowly remove the rear stand and lower the footpegs onto the jack stands. Here is the bike sitting on the jackstands. 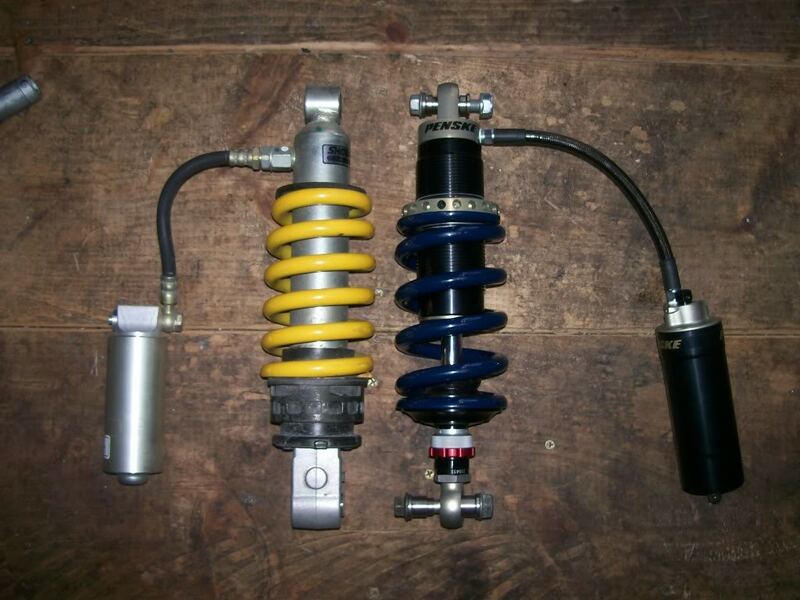 Now just remove the shock and resivour. It takes some tricky movements to get the resivour out. A picture of where the shock used to be. If you have to lift the tank here are some directions. 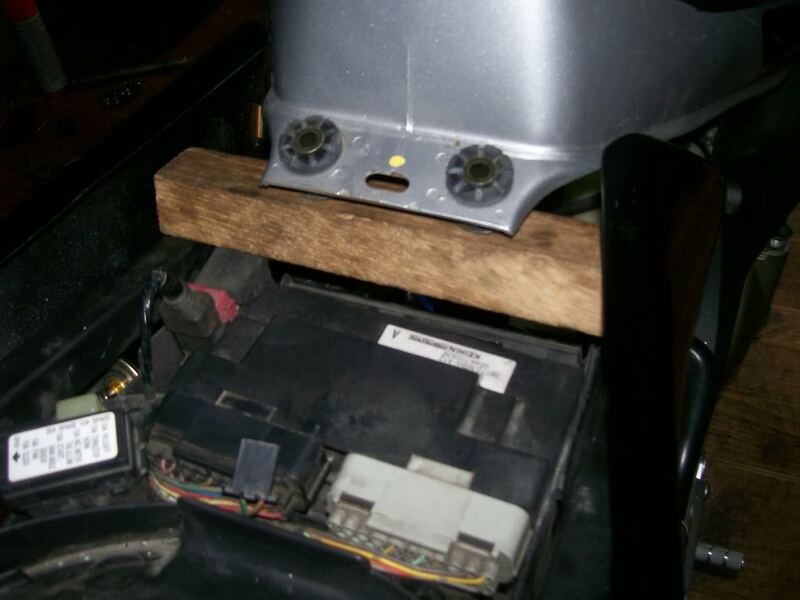 Loosen the front and rear mounting bolts and support with a piece of wood. When you lift it keep an eye on the drain tube it easily comes off. Last edited by geckert; 03-07-2010 at 06:42 AM. A few pics would have been kool if you had them ...? I did this earlier in the week but I am going to do it again to take more notes and get some pics. Ill edit later today. Its actually pretty easy job maybe 1/2 hour if you understand what needs done. 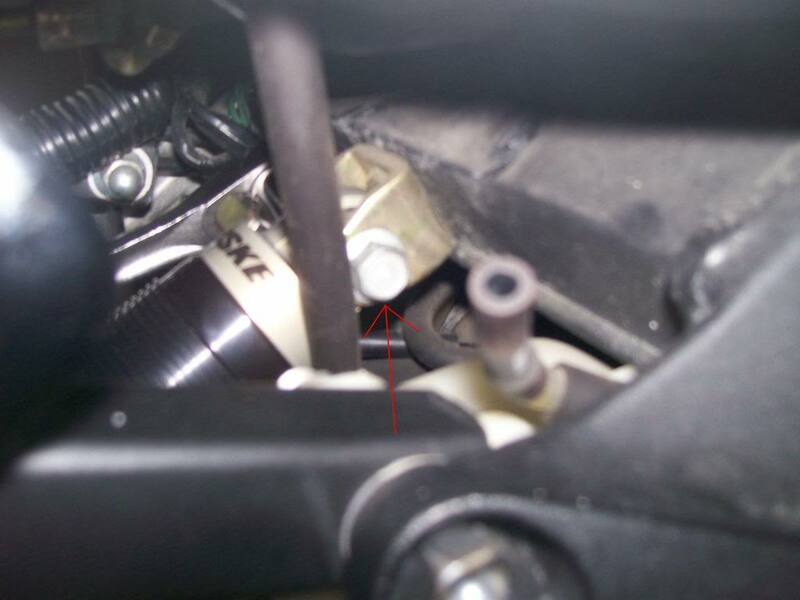 I didnt think it was necessary to mention but if your stock footpegs fold up, like most do, you will not be able to support the bike using the footpegs. 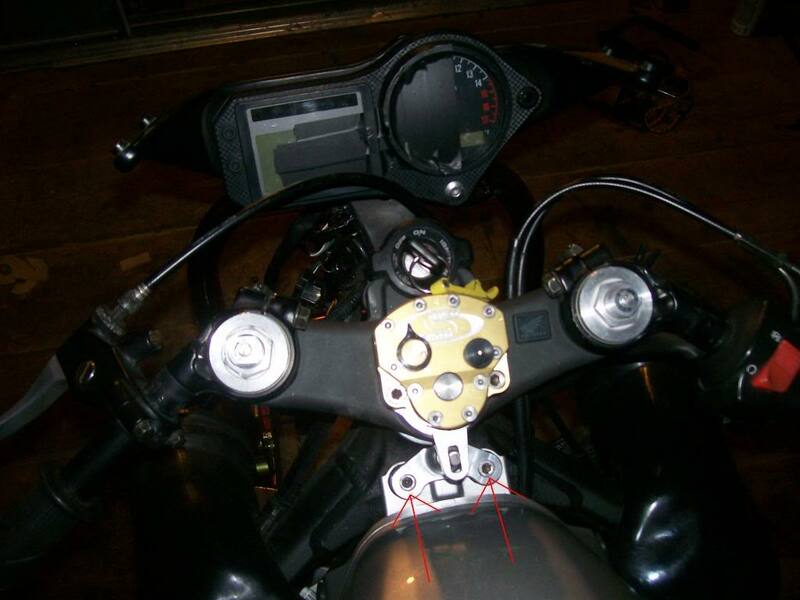 Most aftermarket rearsets/footpegs do not fold. Alternately, you could attach straps to your subframe and suspend the rear end from the ceiling via the beams instead of using the footpegs. 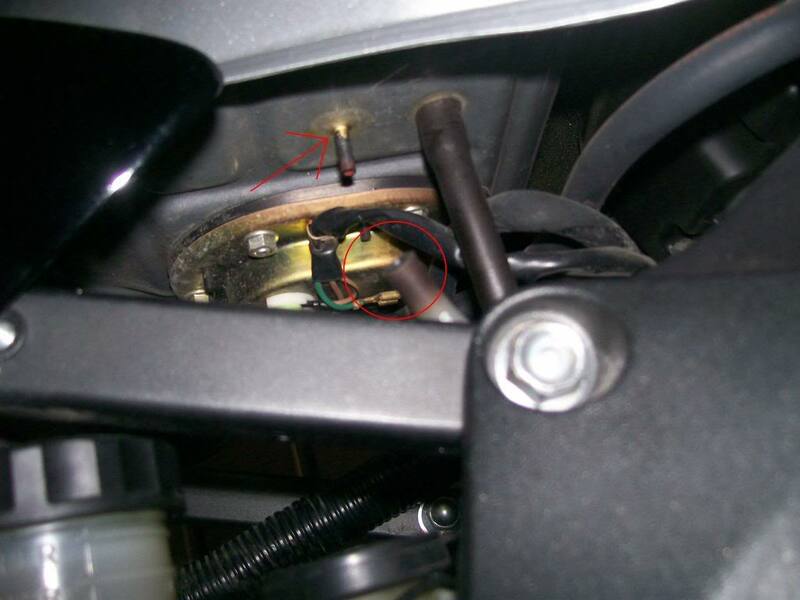 Do you have to remove the shock to remove coolant reservoir?